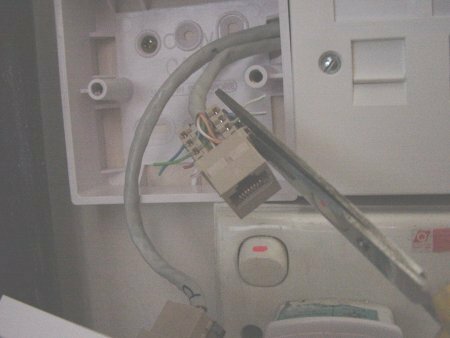 Smart home, it really common to hear this nowadays here in Singapore with homes built with all network cables laid in the walls and RJ45 face plates installed all around the home. 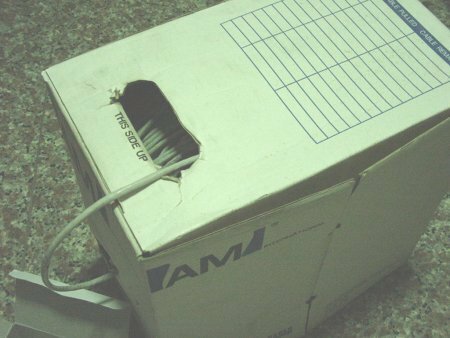 Some even have hi-tech security functions built in such as turning on the air con, heater etc tied to the phone. A call from you and the right combination of numbers and code will turn on the heater, ready for you before you reached home. 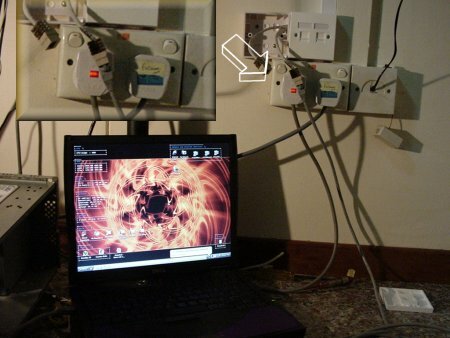 This article will show you how you can transform a “dumb” home to a “smarter” home. 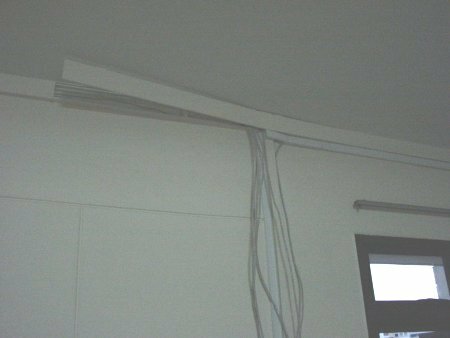 Basically, I will just show you how to do up the trunkings to hide all the unsightly CAT5 cable running all around the house. 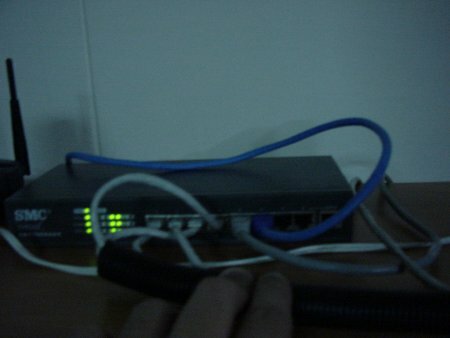 If you are like me who use a router to share the Internet connection at home with a few computers, share a printer,, have a wireless access point or similar, you have at least 4-5 CAT5 cable running around the home. 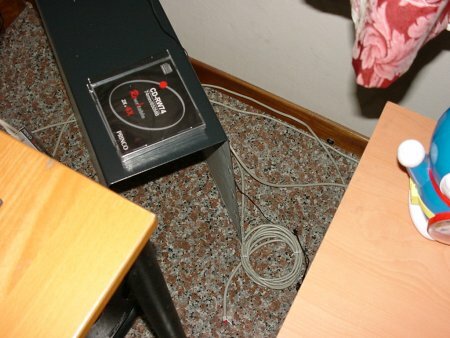 My cable modem was in the living room with a 10 meters CAT5 cable running from this modem to my room where the router is, then 2 cables running from this router back out to the living room where one desktop and a laptop is and 3 cables running around my room where 2 desktop and 1 laptop is. 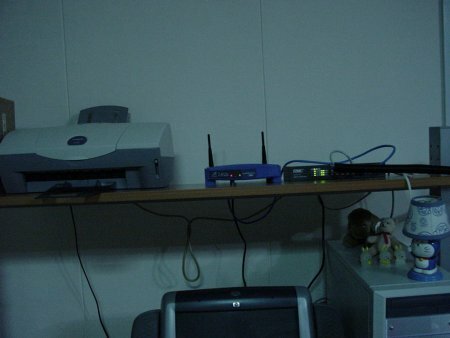 A “before” picture of my router and wireless access point. 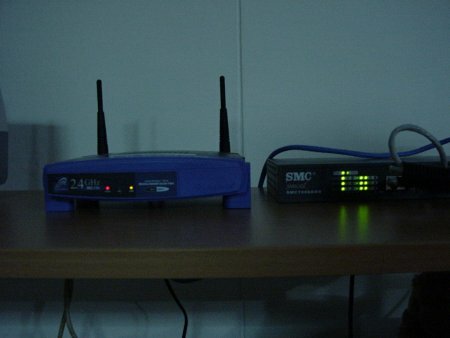 I use the SMC 7008ABR 8 port router for my connection and just got an access point, the Linksys WAP11 recently for the 2 laptops which are equipped with wireless (802.11b) PCMCIA cards. 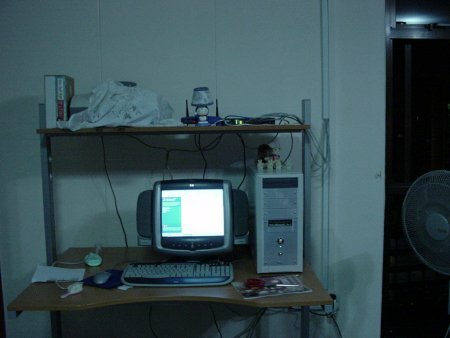 With wireless, still the house was untidy and messy! 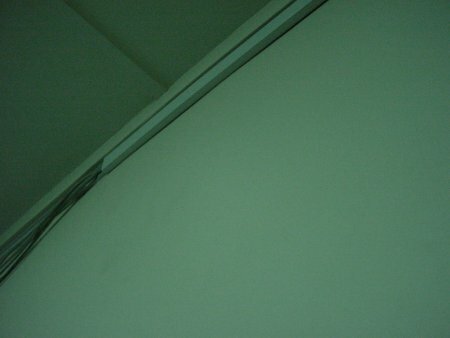 I use 1 inch wide by 2 meter long trunking. Available from hardware stores. 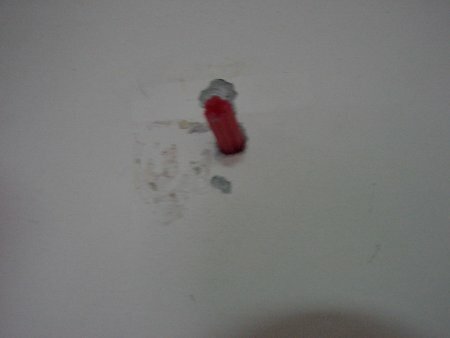 This is for securing the trunking on the wall. Boxes of screws to hold the trunking base to the wall. 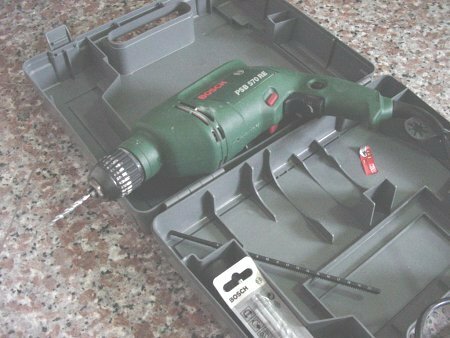 Drop in for drilled hole to hold screws. As much or the length you need. I got mine free from a friend who has a lot left. One full box is 1000 ft. (305 meters), what he gave me was like still having at least 200 meters left. More than enough. 1000FT and that is 305 meters! 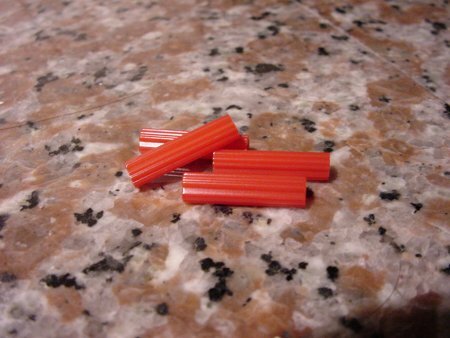 This will be used to make your own custom length CAT5 cables later. 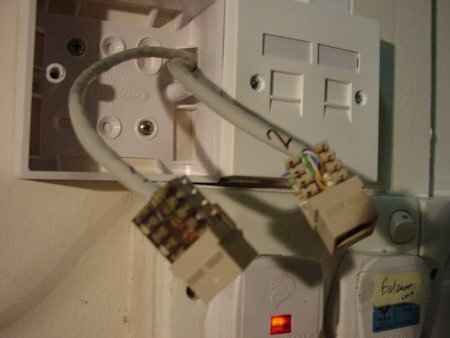 This will be the “socket” you will be plugging your laptop to via a CAT5 cable to. 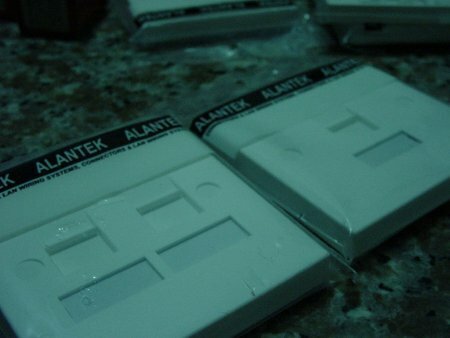 A full set of face plate will consists of the Keystone, Backing and of course the faceplate. Face Plate (Back). 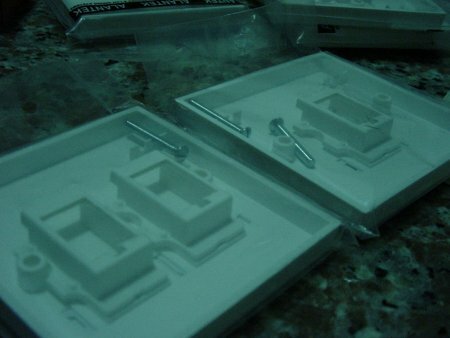 Screws come with the plates. Cable splitter (.50), Crimper (.00), Philips Screw Driver, Flat head screw driver, Hammer, Power Drill, Drop ins (.50 for a pack of 10), Measuring tape, markers/ pencils, Hand saw, Pliers, Scissors/ Pen Knife. 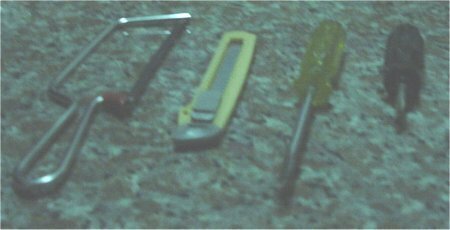 From left: Small PVC handsaw, pen knife, Flat head screwdriver and Philips screwdriver. 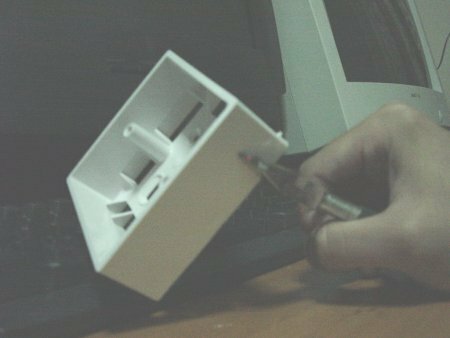 A crimping tool for crimping RJ45 heads to CAT5 cables. 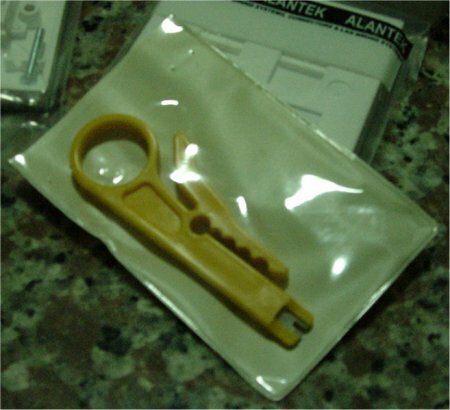 A cable stripper. 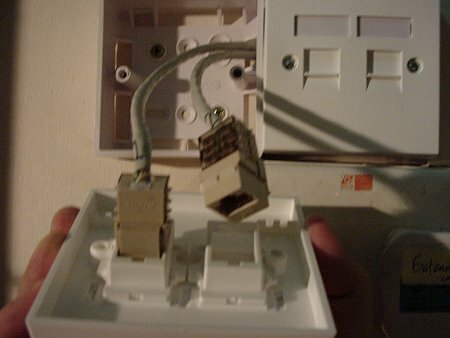 This is also used later to insert the cable into the keystone. I will list out how I exactly I did it including the mistakes that I have made will be pointed out so that you will not make these mistake and I feel that way, you’ll have a better idea of what to do, or you may have a better way of doing it. 1. Where will be trunkings run. 2. 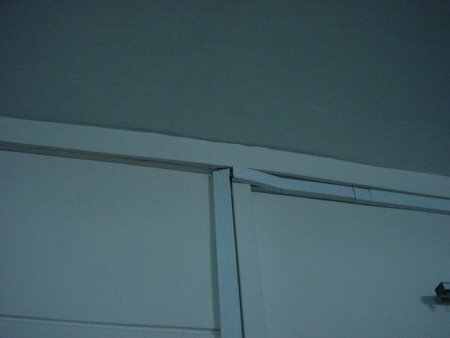 How can they go though the walls (if needed). 3. 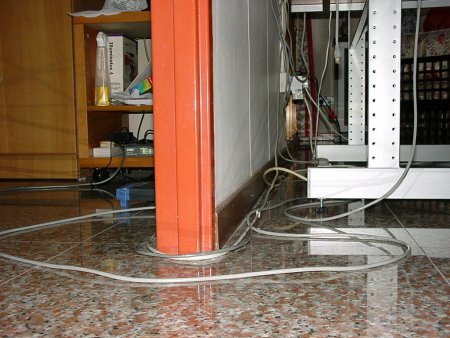 Determine the required length of trunking and CAT5 cable (that is to run inside them) needed. 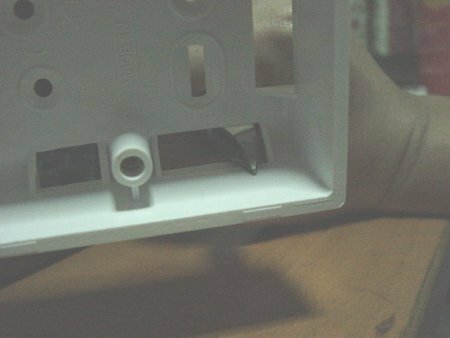 Try experimenting with the trunking first as it can be confusing when cutting the corners and making them turn 900 or cover some parts. 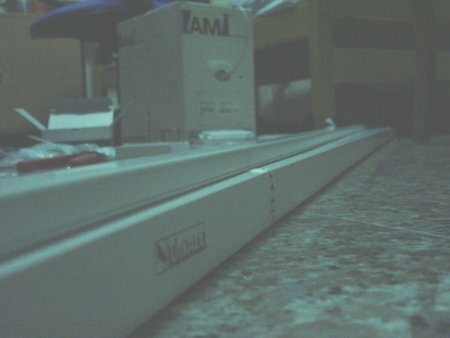 I tried cutting, bending, turning etc on 2 whole meters before I learnt some things on it and before I bought the rest of the trunkings! 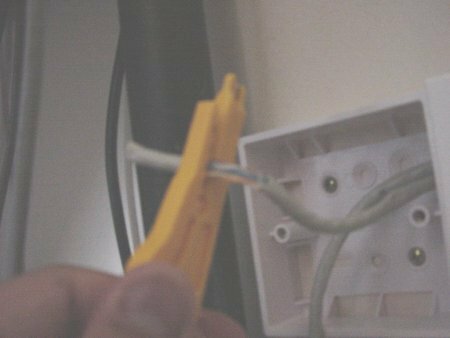 You may also need a friend’s help as at times, with just a pair of hands, it’s hard to do things such as closing the trunking while holding the CAT5 cable in place. Once you have done all the planning, buy your stuffs. 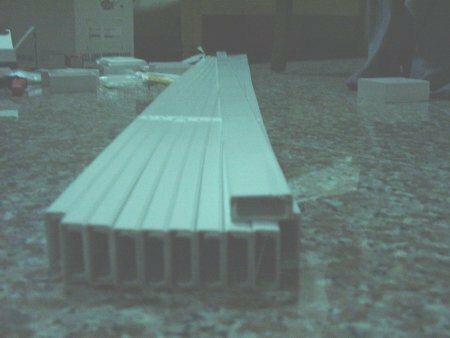 I got the trunkings and nails from a neighbourhood hardware shop. 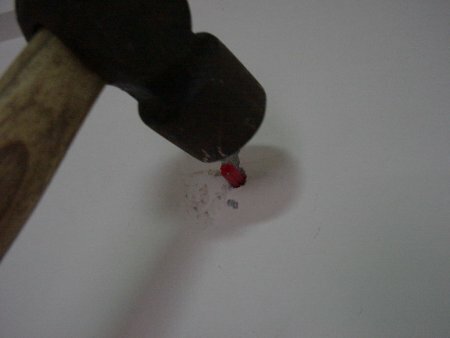 Just ask for nails that will be able to be knocked into walls. 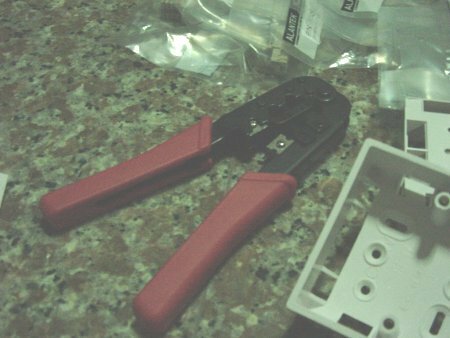 The crimper, keystone, face plates etc, I got it from a shop @ Funan Center as I happen to be around that area and Sim Lim Square was nowhere I was going to and from. The price isn’t really low but for the convenience, I got it there anyway. All there is to do now is to hammer all the trunkings into the wall, cut the length to fit and cut the edges when turns are needed. I will show you some photos instead of a step by step. Figuring out how they were cut should be quite easy. 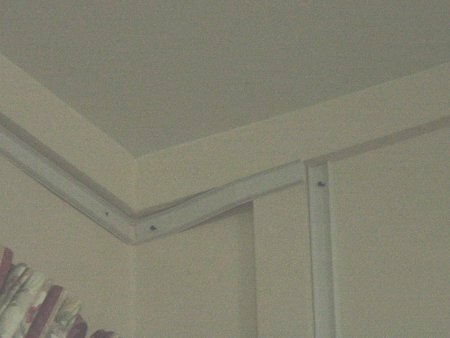 Picture 1 – Living Room – Close up of trunking based holding up by nails. 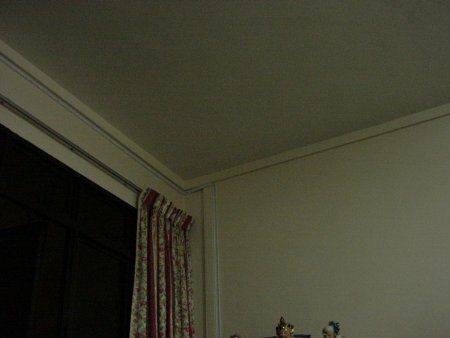 Picture 2 – A zoom out view of the same photo. 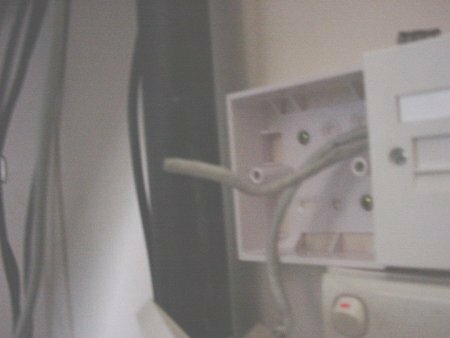 Picture 3 – A close up view of cables between the trunking’s base and cover. Picture 4 – All the cables before covering. Picture 5 – The hold the cables are passed through from the living to the room, this shot is taken from my room. 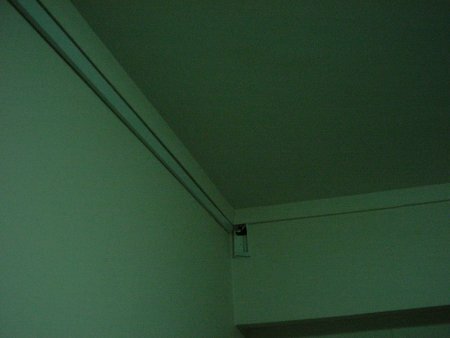 Picture 6 – Another view of cables in the trunking. Picture 7 – The other end of the cable from the above picture, photo taken from living room. 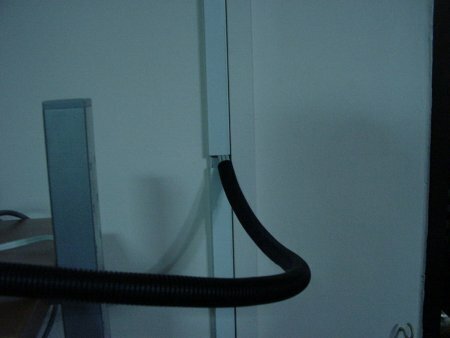 Picture 9 – A portrait view of the same cable. 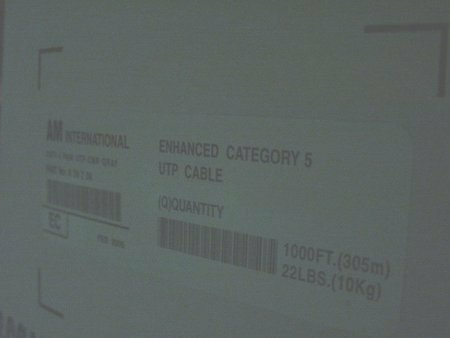 Picture 10 – The cable modem in the a TV rack/ cabinet. 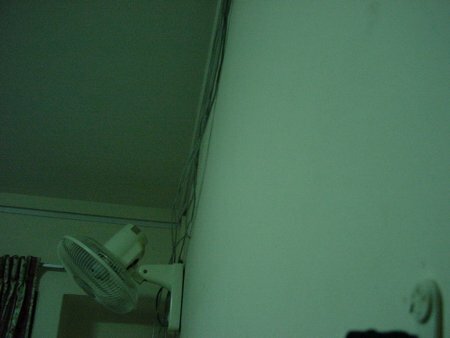 The TV is seen here on the top right of this picture. The cable modem is in the living room next to the TV. 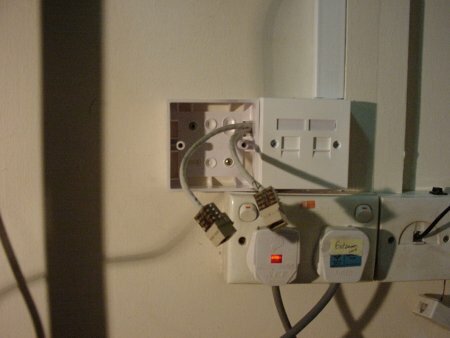 Power is drawn from a nearby socket. 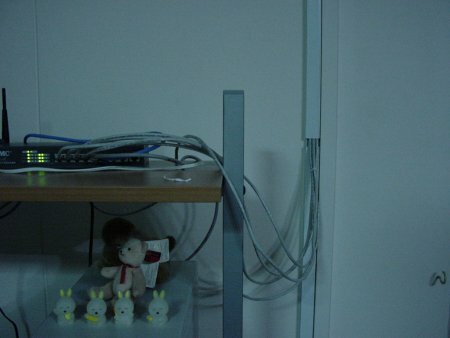 One CAT5 cable will run from this cable modem along the wall upwards (Picture 1 and 2) then along the upper corner of the wall till it reaches the hole (Picture 7) in the wall leading to my room. 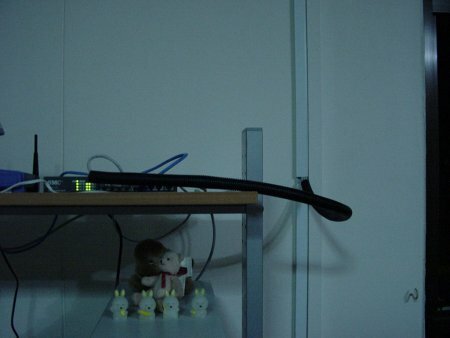 This cable from the cable modem will do down to the top of the table (where one PC (HP) resides) to the router. 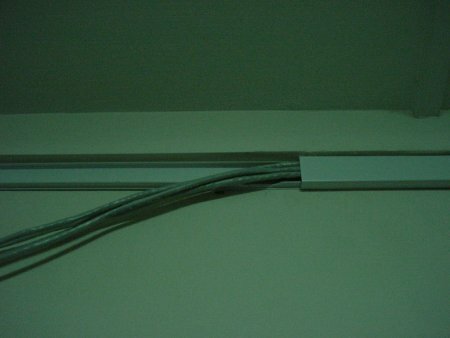 4 CAT5 cables from the router will be hidden into the same trunking, upwards back to the hold into my room (Picture 5). 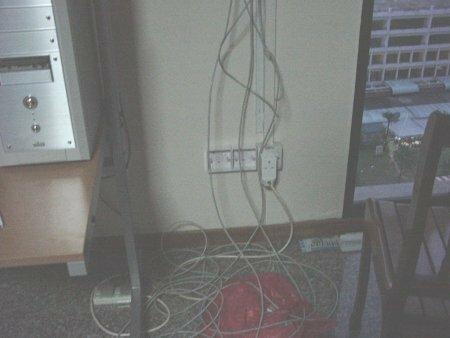 From there, the cable SHOULD have been labelled (don’t make the mistake I made!) BEFORE they are run through the wall. 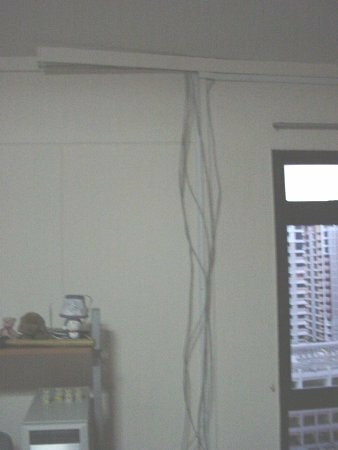 These 4 cable runs the same, on the top corner of the wall around half my room to the corner where 2 face plates (with 2 keystone each) are installed. 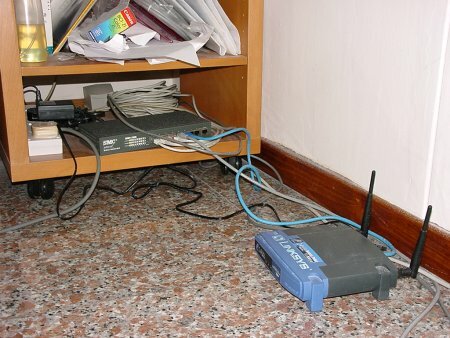 The HP PC will be connected to the router directly. Next comes the most noisy activity (yay! 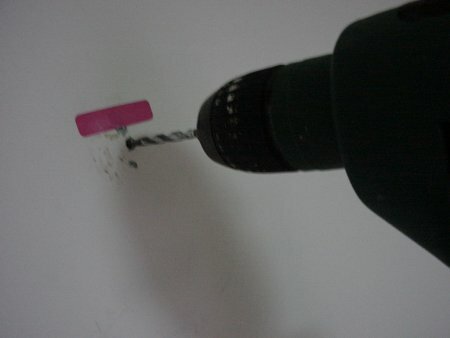 ), drilling the walls where the face plate backing will be. Then knock in the drop ins. Screw the backing into place. 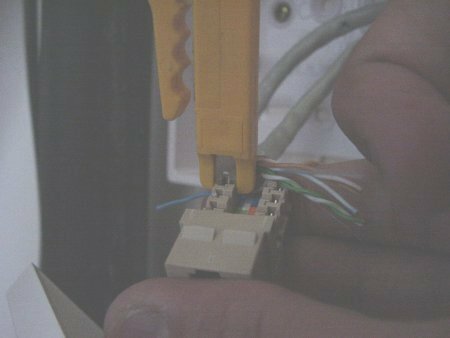 Cutting the backing to allow the CAT5 cable to go into the face plate. Another shot of the cut. 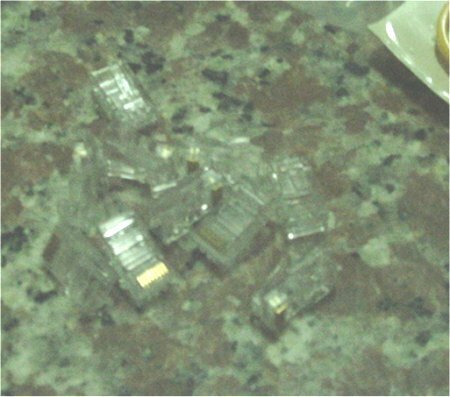 Cut the face plate so that the CAT5 cable will be slotted into them. I find this part kinda fun and it was a really good learning experience. 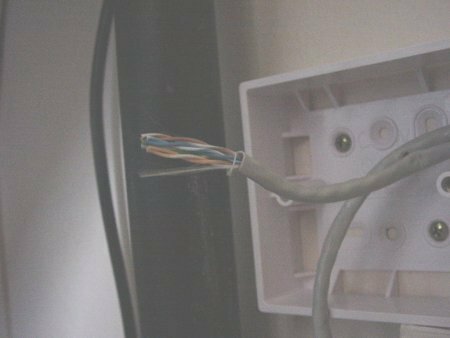 Connect the CAT 5 cable to keystone. I have included a diagram. Mistake: I had a headache trying to figure out the color coding (hey, I am not a full time networking guy!) on the keystone, asking on the Internet didn’t seem to help much either, this may be due to the fact that people KNOWS which color coding to follow. So it was all trial and error for me. I tried using “Config. A” and it didn’t work and so it was, cut it! and redoing it but this time using “Config. B”. And it worked! Config A and B. 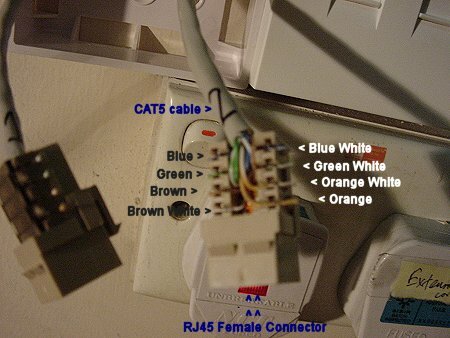 The above color coding should be followed with the female RJ45 connector facing yourself (Which is the exact opposite of the above picture). 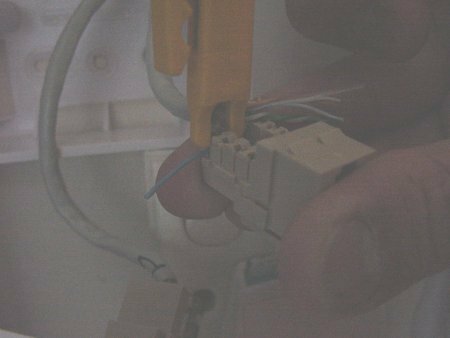 The cables are pushed into the keystone with the same stripping tool, a small, cheap and useful tool indeed! 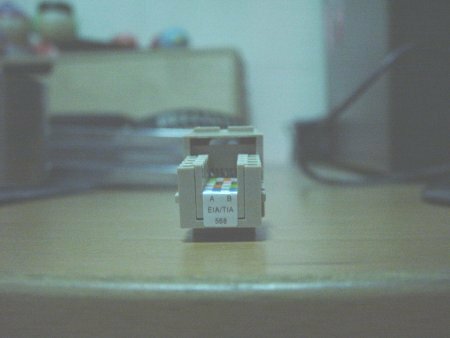 The CAT5 cable in the face plate. Remember to always leave excessive lengths. Using this stripper tool to strip the cable’s outer layer without cutting the inner cables. 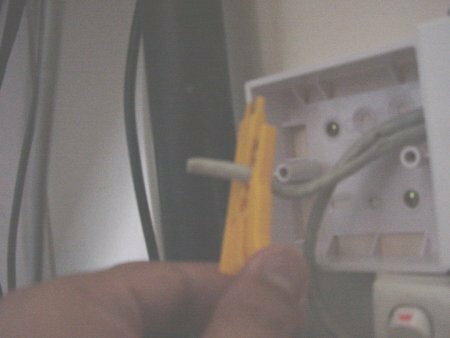 Turn the stripper tool around the cable and pull it away, and you’ll see the inner cables. 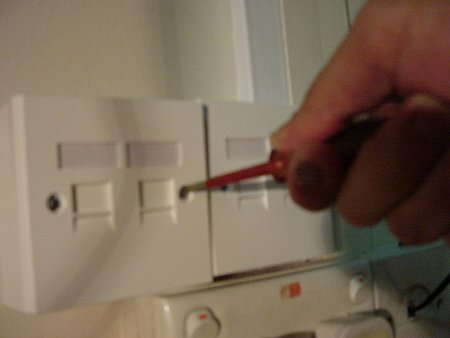 Use the same stripper tool again but the other end this time to push the cable into the keystone. Another view of the “pushing”. 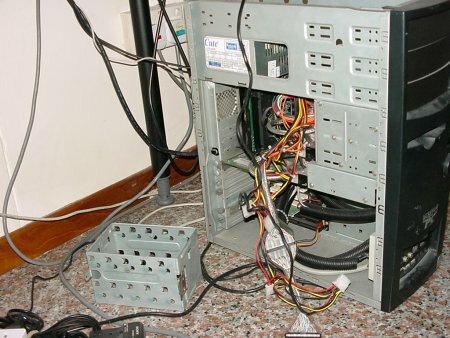 Cut away the excessive cables on the side. 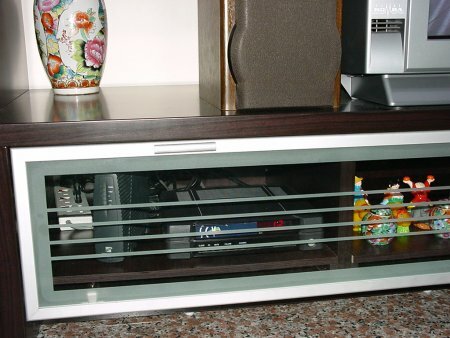 And cover the cables with the provided transparent brownish cover. The finished product DIY style! 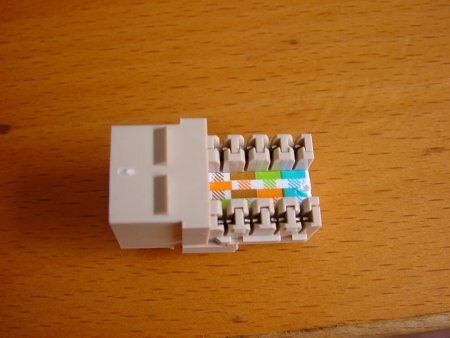 After the keystone are installed with the respective colored strand of the CAT5 cable, test the connection with the other end connect to the router and the router in turn connected to your cable modem. 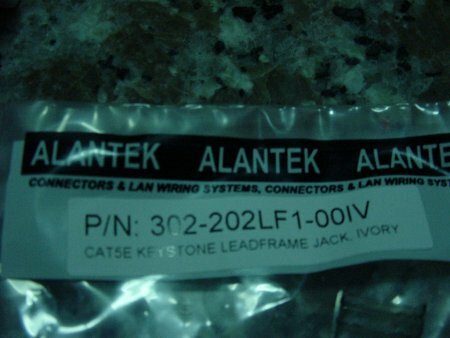 Once you’ve test it, able to “ping” or able to get an IP address, install the keystone into place on the face plate (as seen below) then close the jack and you done! Installing the keystone onto the faceplate. Screw the faceplate into the backing and you’re done! 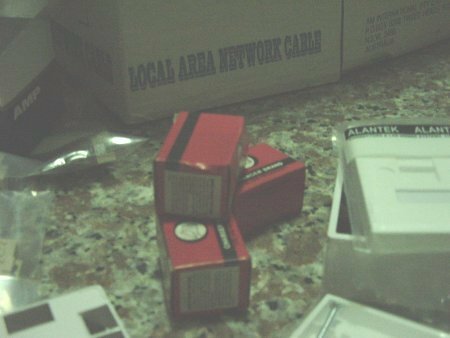 Of course, do give it another final test when you have close up the jack just to be on the safe side. 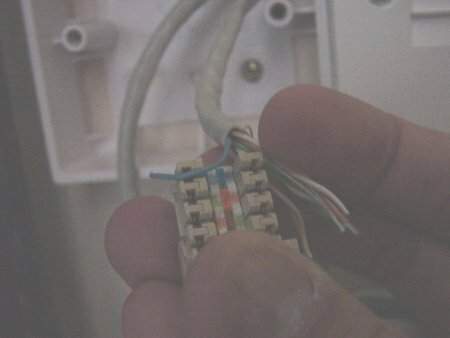 Remember you can juggle the steps in doing up this whole thing like you may like to drill the walls first, then the trunking etc but remember to plan the length and exact position of the backing, length of cables needed and always remember to give some tolerance for the length of the CAT5 cable in case you need to re-crimp the cables. This whole project took me 3 days (excluding the planning) to complete as I have other commitments (no, not work! haha) and it would definitely take me a shorter time if I have take more time planning and so the saying goes, “Failing to plan is planning to Fail”. Well, not really in my case, I succeeded just that it took more time. 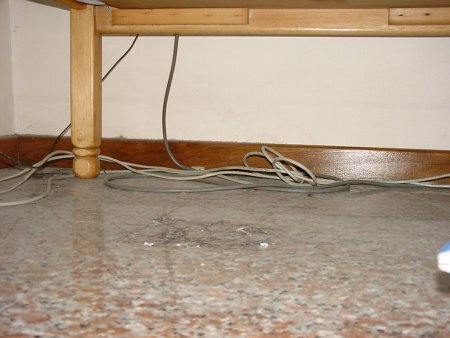 Living room where CAT5 cable from cable modem runs from, to my room where router is. 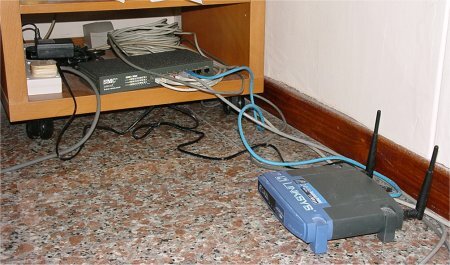 My room, router and wireless access point. Across my room, under my bed. Cable modem now in my TV’s cabinet. A overall view, my HP PC. 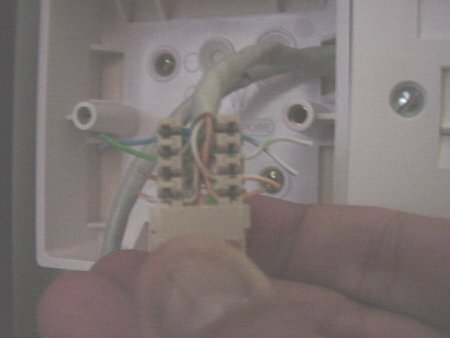 The router with DIY CAT5 straight cables. My Linksys wireless access point. 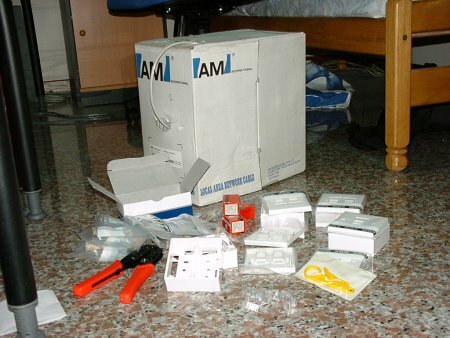 …and my networked Canon S400 printer. If you think it’s gonna be a lot of work and trust me it is but the kind of satisfaction DIY can bring go ahead and do this! I personally learnt a lot through this little project and it’s good for experience.